The skydiving weight limit is 220 pounds, but we can take more in some cases. Make sure to call us if you're over 220! Take a break from the rat race, and experience what few people ever dare to experience in their entire lifetime... SKYDIVING. After a brief instruction period you can be on your way to make a tandem skydive at Canton Air Sports! After two tandem skydives you may qualify for our "Accelerated Free Fall" license progression program. This is the best way to get certified. You will learn all the basics of skydiving while being able to skydive on your own. After completing all of your training you will be eligible to receive your USPA basic license! Our Facility includes two Cessna 182s and visiting Turbine Aircraft, large landing area, indoor packing facilities, bathrooms, showers, picnic and camping areas. We have the absolute best views of the Berlin Lake Recreational Area! 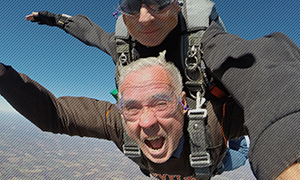 Canton Airsports has been training Skydivers and Skydiving Instructors Since 1974. We're located in the Beautiful Berlin Lake Recreational Area, three miles North of Alliance, Ohio, on Union Ave (State Route 225). 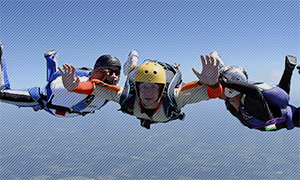 We offer Tandem Skydives and Complete Skydiving Courses for beginners. Our office, hangar, classroom and parachute rigging loft are conveniently located in one building, adjacent to our large open drop zone on Barber Airport. Canton Airsports is one of the oldest skydiving schools in the world and has been operating under the same management since 1974. Our skydiving instructional staff, with thousands of skydives are skydiving professionals certified by the United States Parachute Association (USPA). Many of our competitors made their first skydives at Canton Airsports, and we’re proud of the way the sport has evolved over the last 20 years. Skydiving schools and drop zones all over the world are taking better care of our beginners than ever before in the history of our sport. Free camping is provided on the dropzone and there are motels and restaurants nearby. We have clean, modern restrooms (no porta potties), hot showers and lots of friendly people who enjoy introducing others to our sport. Call Now for a Skydiving Reservation to experience the exhilarating freedom of human flight! Would you like to receive our newsletter five or six times a year? Simply enter your e-mail address below and you will recieve an email newsletter with all of the latest news, promotions, amd upcoming events from your favorite skydiving academy, Canton Air Sports. Also, make sure to bring your non-skydiving friends with you. There is plenty for them to do. Just across the road there is a boat ramp into Berlin Reservoir which is an unlimited horsepower recreational lake.